Product information "Smoke Detector with Relay Output"
Hazards such as fire must be reliable detected and reported as soon as possible. In mission-critical IT infrastructure such as server room suitable smoke alarms must be installed. Even unmanned infrastructure in branch offices should be equipped with this Smoke Detector. This intelligent smoke detector belongs to the group of optical smoke detectors and works on the principle of scattered light. The smoke detector operates autonomously and is powered by a 9V lithium battery. With support of it`s integrated testing function of the measuring chamber, a high level of operational safety of this smoke detector is supported. Didactum`s smoke detection sensor also detects possible pollution and reports this via the integrated fault indication LED. If smoke enters the detector, it produces a loud warning signal with more than 85 dba. This smoke detector can be mounted by 2-wire signal cable to all Didactum IT alarms with dry contact input (dry contact board mandantory). 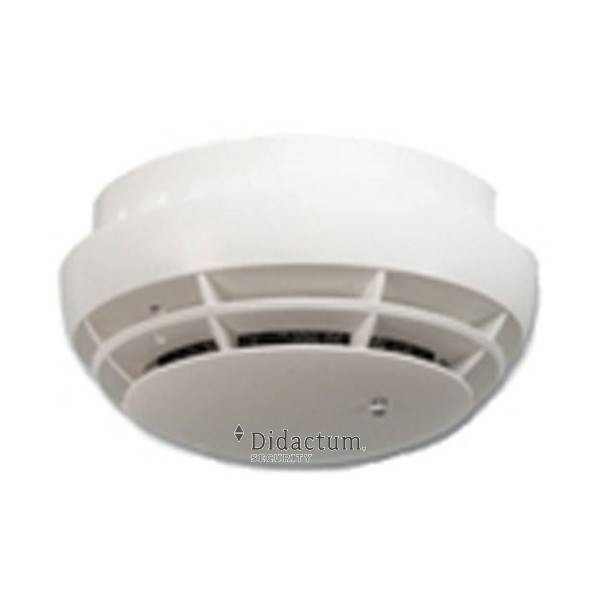 In the multi-lingual web interface of the Didactum remote monitoring system, you can configure this smoke detector. In case of fire, Didactum`s remote monitoring device can alert you by e-mail, by SMS (GSM modem required). It can also send traps to SNMP-compliant building software or Network Management Systems (NMS) such as Icinga, Nagios, OpenNMS, WhatsUp Gold, etc. Related links to "Smoke Detector with Relay Output"
Customer evaluation for "Smoke Detector with Relay Output"